Prior to deciding on anything, you must define what your project’s needs involve. Are you throwing heavy or light material, wood, shingles, or house siding? Dumpster rentals service a variety of people including contractors, homeowners, businesses, realtors, and landlords. Here are three things you should consider when thinking about dumpster rentals. One important step in the process is to choose your dumpster rental size. All dumpster rental sizes are be determined by cubic yards. For instance, a 10 yard dumpster will hold 10 cubic yards of debris and junk, a 20 yard dumpster holds 20 cubic yards of junk and so forth. See more about dumpster sizing here. Before you start thinking about 20 yard dumpster rentals, it’s important to understand the extra fees that may be involved. Some of these are good enough reason to rent from a different dumpster rental company. Once you have determined your project needs, dumpster size, and you understand the costs, you can begin to compare and contrast the dumpster rental companies locally. Comparing dumpster rental services by price is a great indicator on who you will choose, but try not to overlook these other characteristics of a good company, and the potential of a great experience! 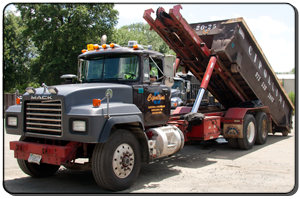 Learn more about dumpster rentals by calling (973) 983-1001 and asking us your questions right now. ← The future of garbage – yes, again!